Isn't it strange how we have amazing seafood in this island and yet we don't eat a lot of fish. Furthermore good fishmongers selling fresh fish are a rare breed and rather hard to find. Gone are the days when you could pop into Molloy's off Grafton street or Sawyer's on Baggot street and pick up some fresh catch. Recently on a trip to Howth , I purchased some mighty and very fresh Scallops and couldn't wait to get home and cook them. Scallops are highly regarded and expensive and should be eaten as soon as possible after buying. If they are still in their shells, open them by separating the shells with a knife or by putting in a hot oven. The edible part is the round white muscle and the orange roe, called coral.The frilly gills and mantle should be removed and can be used for soups and stock. The best way to cook Scallops is on the pan, but they can also be steamed, grilled, poached or eaten raw in a Ceviche. Here I seared them in a hot pan but cooking should always be brief so the Scallops stay sweet and juicy. This delicious dish will be on the table in 15 mins and better still, it's all prepared in one pan, so there's hardly any washing up. And if you are not watching your intake of calories,this dish tastes delicious served with warm crusty bread. 10 king scallops, sliced horizontally to give two even discs, which will make each helping look more generous and ensures that they cook evenly. 1/4 of a Savoy cabbage , thinly sliced. Heat a good solid bottom pan, add a tbsp of olive oil and allow to get hot. Meanwhile season the scallop with salt & white pepper. Scallop benefit from from resting period seasoned to remove excess water ( 2-3 mins ) but don't leave them for too long as they will dry out. Pan- fry the scallops on each side for 1-2 mins, depending on thickness until slightly coloured. Slide on a dish and keep warm. De glaze the pan with the vermouth, and add in the cabbage and fennel. Next add in the tomato puree, lemon juice, lemon zest and fish stock. Bring to the boil and allow to reduce. 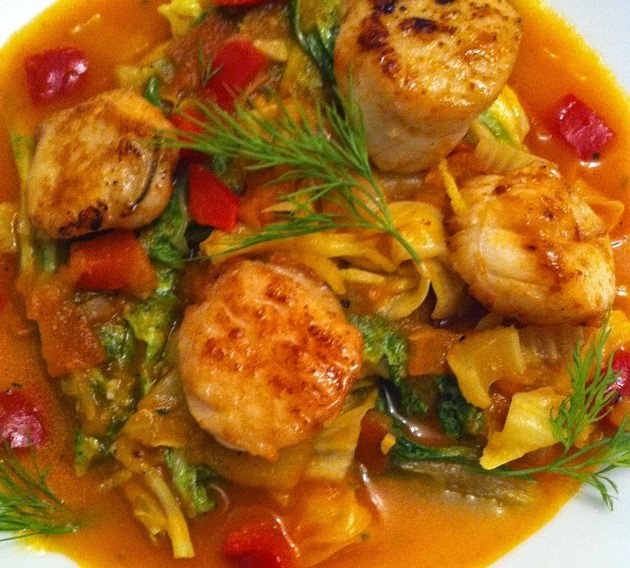 Add in the chopped tomatoes, season to taste and finally return the scallops to the pan and serve immediately onto warm plates Garnish with the fennel frond. Well, food doesn't get any better than that.